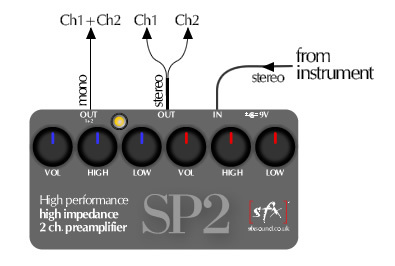 The SP2 is a compact preamplifier specifically designed for tapping instruments (Mobius Megatar, Chapman Stick, Warr guitars...). The unit contains two high quality preamplifiers suitable for studio and live applications. 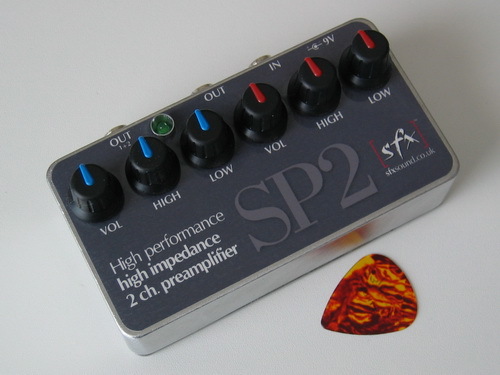 Thanks to its high-impedance inputs, the SP2 preserve the natural sound of your instrument even passive pickups. Every channel has a separate equalizer tuned for wide frequency range response and the volume control sets the output level independently for the two channels. Two outputs allow maximum flexibility. The stereo output delivers a warm full sound of the two channels. Internally, the SP2 contains an active mixer that mixes the two channels delivering a high quality sound through the mono output. This is ideal if you need a quick and effective solution for playing through a standard guitar or bass amplifier. The SP2 is hand built in the UK using the best parts available. The enclosure is made of diecast aluminium alloy, potentiometers are sealed and electronic components have been selected for the best audio quality. Andy Salvanos recorded all of the pieces of his albums, "Dream recall" and "Transform" using a [sfx] SP2. You can listen to the album clicking here. After meeting Max from [sfx] in London through our interest in the Chapman Stick, I discovered his love of all things electronic and pedal based. We talked about coming up with some cool ideas for pedals that could be used for the Stick that sounded good, were simple to use and built to be used and thrown around at gigs without falling to pieces. So after many months of talking, playing through, drawing diagrams and analysing many of his funky little creations he handed me the SP2 to test out. As any gigging or studio musician would know, having something that is simple and sounds great from the word go makes life so much easier when trying to create and play music ...and I can't believe how I lived without this little pedal for so many years! The concept is a fairly simple one, a stereo input from the pickup of the Stick goes straight into the box and there are independent controls for each side of the Stick incorporating volume and low and high eq and a stereo output and separate mono output. Straight away it really brings out the clear 'acoustic' qualities of the instrument with lots of headroom and clean wide open bandwidth that the Stick needs to sound good as an instrument in the hands of the player. Straight away i found myself.....well....playing! No fiddling around with knobs and fussing with the sound. It just sounds great... as simple as that. A great little tool for gigs and recordings where you want the clean authentic sound of the Stick direct (or into extra fx pedals) into a mono amp or into the mixing desk with minimal hassle. Who know what [sfx] will conjure up in the future? But i have a feeling it will be pretty funky. Hope you like the pedal as much as me. But as Keith Richards said "talk is cheap" ...just use your ears and get playing. * All product names used in this webpage are trademarks of their respective owners, which are in no way associated or affiliated to [sfx].